So, Tuesday 15th November 2016, I was invited to speak at the 8th PREM – Perinatal Research and Education Meeting. This meeting aimed to give an opportunity for neonatal professionals across the northwest to share research, audit and examples of good practice and enable medical trainees, nursing and allied health professionals to present their work to their peers. This year, the emphasis was on Family Centred Care and there was a range of speakers with particular expertise in this area, with the objective of informing and supporting professionals in the support of families and their babies. 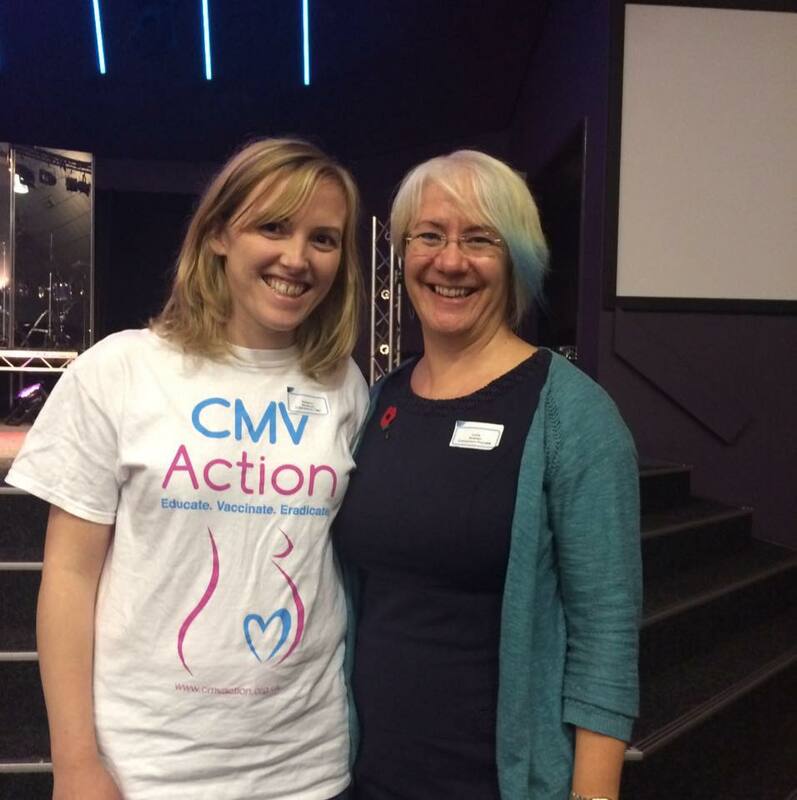 I was really honoured to be asked to present, on being a mum of a child, affected by CMV and a parent volunteer, at CMV Action. “Hi, I’m Rebecca Blinkhorn. Mum to Shaun age 7 and Mikey, 4. I’m here today as a parent volunteer for CMV Action after my little boy, Mikey was born ten days over due, with Congenital Cytomeglavirus in 2012. CMV Action, are a small UK charity working to support parents with the prospect or reality of a diagnosis of Congenital CMV. We aim to educate professionals, parents to be and the general public about prevention of CMV and support the development and implementation of research into better testing, treatment and management of CMV. We hope our work will some day, result in a vaccine to prevent the harm and heart break this virus causes. So, here is our story. I’d had an entirely uneventful pregnancy really and had tried desperately to avoid an induction, after a failed induction with my first baby. In my previous pregnancy, I’d had Obstetric Cholestasis so we’d been on the look out for that, but nothing else! I went in to labour eventually ten days over due, and the moment my waters broke they were thick with meconium. We struggled throughout the night to keep a good trace on Mikey and had lots of scary moments and he was eventually delivered by Emergency Caesarean Section. The moment Mike was delivered I knew something wasn’t right, his cry was unlike any sound I’ve ever heard. Having had a section before it had startled me how beautiful and strong that first cry was. His wasn’t. I was just thinking, calm down, these things don’t happen to people like me. Do you not think I’ve been through enough tonight?! Baby was covered in a rash and he was small for gestational age too. We left delivery and were put on the ward, it was around ten hours later that we started to test blood sugars because of his size and discovered they were dangerously low. I then began desperately trying to express milk to keep his sugars up. By that evening, which happened to be a Saturday, I had two doctors at my bedside telling me baby was poorly and needed antibiotics. I knew it must be bad, as seeing two doctors on a Saturday night together, is unusual. The next morning he really had taken a turn for the worse, he was taken from me, into the Neonatal unit and immediately given platelets. There began this journey with CMV. I found this time really hard. I’d looked forward so much to introducing Mike to his brother, I’d dreamed of the cuddles, the breast feeds, the first magical few days and it was gone. I visited Mike in his incubator but felt so distant and detached that I couldn’t make him better – he didn’t need mum, he needed doctors. I remember returning to my room and feeling so guilty I couldn’t take care of him. All I wanted to do was take him and his brother and run away from all of this. The following morning Mike’s consultant Lydia Bowden, became involved in his care. I by this point, had developed horrible symptoms, like a tummy bug and was barrier nursed to my room. By that evening I’d had three episodes of illness and could no longer see Mike. This broke my heart, even more than I can remember and I still wonder how I ever made it through this time. When Mike was around 48 hours old the suggestion was that this was a virus. Phew! We thought, I was right things like this don’t happen to me. He’ll be ok.
By the 3rd day of mike’s life we learned that actually a virus was nothing to be relieved about at all. She never ever took her eyes away from me and it was the reassurance I needed at the moment in my life. It felt like she knew I could handle this, so I would. I ached to get to that incubator to say sorry, I didn’t know. But I couldn’t because I was barrier nursed to my room. Watching my husband sob and not being able to go and see our baby with him, was truly awful and I wish so much I could back to that moment to tell us, it’d be ok.
Our Consultant had given us some information about CMV Action at diagnosis. I wasn’t able to read anything at the time. My mind only on getting my baby back. My husband did take it home and I asked my sister on my behalf and my father in law, on my husband’s, to research as if they were us, as neither of us could do that as it were. Both my sister and father in law were immediately able to talk to our chair at CMV Action, Caroline, over the phone about what was happening. She gave tons of useful advice but I remember it proved to be a light out of the darkness for me, seeing that someone else could live through these times and go on to support other families and be ok. I remember she gave my sister her mobile number and said tell Rebecca to ring me any time day or night. I knew I wasn’t alone, someone else knew how it felt to be me. It was so reassuring. The following days were tough, we didn’t know when I’d had CMV at that point so we weren’t sure about the effects on Mikey. I’d had a horrible chest infection at 35 weeks and we’d hoped that was the infection but it transpired I’d had an active infection at booking in, at around 7/8 weeks pregnant. Just the news we didn’t want! Mike’s newborn hearing screen had been clear, his sight was fine too but his MRI scan revealed a small amount of calcification. We decided, knowing his sight and hearing were unaffected, to go ahead with the six week course of Valganciclovir, the recommended anti viral treatment. Scary prospect as his white cells and platelets were already very low and we were going to hit them again. At one stage we didn’t know how we’d get Mikey home as his platelets dropped and dropped, but we came up with a plan of, ring an ambulance if he changes at all and don’t let the toddler loose on him! I laugh now at how I took that in my stride but I knew so little. If I knew then, what I know now it’d be different I think! My horrible symptoms weren’t CMV or any other illness, just anxiety and stress, as a result of the separation from my baby. We knew that all along really, but with CMV hanging over us, we had to be sure. Within 24 hours of starting Valgancilovir his platelets shot back up to a healthy level and have stayed that way. We got through the six weeks treatment without a pause, staying indoors and keeping visitors away. His white cells dramatically dropped at one stage and we considered having to pause in treatment but he resolved it himself. Mikey’s development has followed that dramatic course ever since! Mikey doesn’t have hearing loss like most CMV children, at the moment. I put this very much down to our consultant’s proactive approach in the first days of his life and the prompt use of Valganciclovir. His eyesight is currently unaffected by the CMV, although he has glasses. Eyes and ears continue to be reviewed regularly throughout the year as per the advice. We’ve had so many ups and downs, the biggest being his feeding disorder and Mike never being able to wean. By nearly two, Mike’s intake had dropped dramatically and his weight dangerously low, we had to resort to NG tube feeding. After a long eighteen month battle, I was lucky enough to secure funding through our CCG for behavioural therapy, to train Michael to swallow food without vomiting and develop eating behaviour. We worked with leading Connsultant Clinical Psychologist, Clarissa Martin and Mikey subsequently has avoided tube feeds. His eating problems continue but he now has a safe intake of foods and will tolerate enough to keep him healthy. Mike’s psychologist explained that damage to his nervous system caused by CMV, had left him struggling to move away from his newborn instincts of survival and attachment. He walked at nearly three and went from no sound at all to wonderful language, very quickly after the behavioural intervention. He’s now attending main stream school with his brother, with one to one support and is really thriving. At four with the arrival of his Education and Healthcare Plan, his global developmental delay is now being called a learning disability and his paediatrician and I, debate continually whether or not an Autism diagnosis is of use to him right now. He has real issues with coordination and his sensory processing difficulties impact every area of his life. Mikey doesn’t have the typical hearing loss associated with Congenital CMV, but audiology are keen to investigate auditory processing difficulties when he turns seven. At the moment we are investigating absence seizures which has come as quite a scary prospect. Overall he’s a delightfully happy child, with a desire to learn and succeed like nobody I’ve ever met. He’s a true survivor, who never ever lets things get the better of him and we are so proud of him! Four years on, there is so much I’ve learned about what a diagnosis of CMV can bring and the issues associated with that. I had a chat with some of our parents to see how their experience differed from mine. For me, finding out Mikey had this cold virus, I’d never heard of was really hard to get my head around. You spend your pregnancy avoiding cat pooh, not visiting petting farms or eating cured meat, but nobody tells you the risks that other humans can pose to your unborn baby. For many mums, they feel an overwhelming sense of guilt and embarrassment, that they didn’t know and therefore couldn’t protect their baby. They wish they’d been educated about the risks that CMV posed to them, particularly with a toddler at home or if they worked with young children. I remember only once feeling fear, that people might blame me for giving Mikey this virus, literally as the consultant explained it to us. However, Lydia erased all my fear and reminded me that really, this was just one of those things and there was little I could have done to change it. The only wish I guess, is that I’d have caught this when I should, as a toddler. But these things happen, hey. It makes me really sad that mums sometimes don’t feel comfortable in explaining their child’s diagnosis of cmv for fear of reactions. We wish so much, at CMV Action that health professionals would advise women of these risks and talk to them about prevention and just be more familiar with this really common virus. It seems to me, nobody wants to be accused of scaremongering, so we avoid talking about it. Because in reality how can we stop pregnant women catching it?! In the early days of Mike’s life there was lots of confusion around how much of a risk he posed to other people. I remember the day we went to the eye hospital, in his incubator and the nurse receiving us there, shouted at the ambulance for bringing this infection to the hospital. Inside I crumbled but I didn’t have the strength to correct her, that people sat in the waiting room were posing the exact same risk to her and her hospital. We regularly have families approaching CMV Action for advice, where their children have been excluded for fear of infection risk or there is panic over our CMV children being around pregnant women and babies. These scenarios break my heart as it’s a complete misunderstanding and lack of confidence in understanding their diagnosis. Only last week, we had a mum diagnosed antenatally with CMV, who was told by her paediatrician after the birth, not to breast feed. CMV can be passed through breast milk. However, if a baby is born full term, and mum has CMV, the baby will not develop any problems if mum is breast feeding. I often say, breast feeding saved Mike and I. It was the one thing I could physically do for him. I’ll never forget the lengths the staff at Wythenshawe Hospital went to, to ensure I had contact with Mike, even when I was barrier nursed. One of the most beautiful moments of my life, was the night we brought the neonatal unit to my room as I was desperate to see Mike and struggling to express, because I was so stressed out! The literature available to me in hospital was all focussed on healthy babies and it left me in a panic I might not bond with my baby. Four years on, I don’t think it’d be possible to have a closer bond with anyone else, ever! I breast fed Michael until he was around 18 months. We were stuck in the dilemma in the end, of will he ever stop and his feeding speech therapist could write a book on the hours of support she gave me! My own sister, pregnant at the time I had Mike, was told by her antenatal team this was so rare and they offered her little reassurance. The confusion about my son’s risk to her baby, meant she didn’t hold Mike until, he was four weeks old. It was when I finally had chance to ask Lydia, our Consultant and she reassured me it was fine. The thing is, so many preschoolers carry this virus. But our Congenital CMV children pose no more of a risk than any preschooler with the virus, it’s just we know our Congenital CMV children have the virus, our preschoolers we don’t tend to. Our advice at CMV Action is for pregnant mums and mums to be, to exercise basic hand hygiene and other measures, like not sharing food or kissing children on the lips, in attempt to avoid catching the virus. This isn’t a solution, as a mum it’s impossible to avoid your toddler drooling on you or sticking his finger in your mouth unannounced. Talking to a virologist recently, he completely agreed! A vaccine really is the way to stop this, but the preventative measures are something we can do in the meantime to at least attempt to control this and reassure pregnant women whilst keeping this on their radar. Our CMV babies aren’t a health risk to pregnant women, all children are!! At CMV Action, we really want to support and educate families. We’d really urge that you put families you know, in touch with us. We can link families up if they like. When I had Mikey there was a family in Portsmouth, four weeks ahead of us. knowing they were facing this too was a great source of strength. I used to text the other mum during hospital visits and she knew exactly what I was going through. There is a wealth of literature [available from CMV Action] for families available too and this can be really helpful in explaining their child’s condition to school, day nurseries etc. As often this is a stressful and confusing conversation for families to have. Over the last few years, we’ve had an annual get together for our families and professionals, hosted by CMV Action. It’s an opportunity to catch up and meet others, in the same position. It’s a great source of support and often the first time for families meeting other, CMV families. In 2017 we are hoping to arrange a day out for our families, just to see can we engage with more people. Our website has tons of useful information, for families and professionals to look at and use. We are really active on social media and it’s a great way for families to ask questions and find out information. We supply our information free of charge to professionals and this can be ordered through our website. I have lots with me today, for you to take away! Our website is the most up to date place to see the latest CMV research, guidelines and the latest projects we are involved in. We’ve recently launched our first CMV e-learning module focussed on antenatal care, for midwives and have more planned in future. We are currently supporting research bids on antenatal screening and targeted screening of babies who ‘fail’ newborn hearing tests. We’ve recently embarked on a project to focus on women who work in childcare settings. Our aim, getting people talking about CMV so it doesn’t remain this unheard of, virus. We have a handful of professionals who support our work and are always keen for people to become involved. Before I finish I would like to say thank you, for allowing me to speak to you today. In particular, I’d like to say thank you to Lydia, our consultant for supporting me to be the advocate and carer I am now, for my little Michael. The moment she stood by my bed and told me my baby wasn’t the healthy baby I thought he was, my life and my outlook changed forever. She always respected my husband and I, as individuals and encouraged us to be involved in his care and treatment, even though neither of us are medical people. I stand by the fact her confidence in us, helps us beat the regular blows that CMV continues to send our way. I’d like to end on our awareness video, simply because it celebrates our lovely children and illustrates just how differently a diagnosis of CMV affects child to child. Of course I cried, so did Lydia our consultant. I was met with so many huge hugs. Reminiscent of the NHS staff, that cared for us when Mike was born. Hugs were in an abundance, because sometimes there just are no words. Feedback from the audience left me shocked so few knew about the support CMV Action was providing to families, so I’m delighted I was able to inform professionals, as CMV Action has been of ongoing support to me. Questions were raised as to why the NHS screens for HIV and Rubella when the incidence is so uncommon, while CMV poses so much more of a risk to so many. I learned that in Greece, for example, women are routinely screened for CMV at booking in and advised of their risks if they fall in to a ‘high risk’ category. All really interesting stuff! All my literature was taken, hooray! Wish I had taken more!! And I’ve another date in the diary, this time speed dating training, where Congenital CMV is in the hot seat! Can’t wait!! I was delighted to represent our CMV families on Tuesday. Reminds me once again how much work we need to do. I went there nervous, as to what I could tell these professionals that they didn’t already know. I soon realised it was plenty!